Portland has an unusually rich variety of distinctive, design-driven boutique hotels, historic properties, and charming B&Bs, and while you’ll find the usual mix of budget-oriented, midrange, and upscale chains here, if you’d rather avoid cookie-cutter brand-name properties, you’re in the right city. While you won’t find ultraluxury brands like Four Seasons or W Hotels, the vast majority of downtown properties are high-end, with the rates to prove it, especially during the week when conventions are in town, and during the summer high season, when many properties command at least double what they can during the slower, wetter winter months. If you are watching your pennies, the good news is that Portland has a nice variety of relatively affordable lodging options just across the river from downtown in the somewhat bland but conveniently situated Lloyd District (in the city’s Northeast neighborhood), and also quite a few charming, intimate inns within walking distance of the trendy dining-and-retail neighborhoods on the East Side, such as Division Street, East Burnside, and Northeast Alberta. As is the case in most cities, you can also find excellent deals around the airport as well as just across the Columbia River in Vancouver, Washington—the latter is a good base if you’re dividing your time between Portland and the Columbia Gorge and are looking to save a little money. 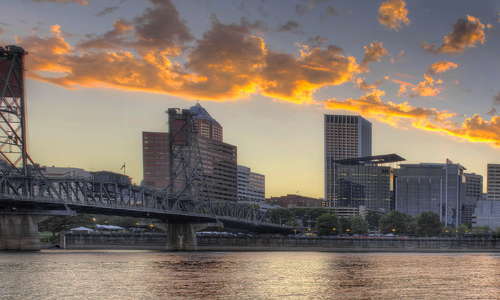 Hotels downtown, in Lloyd District (by the convention center), and in some cases out by the airport are within easy walking distance of MAX light rail, and wherever you stay in Portland, you’re generally close to a bus line with access to downtown. If you have a car, bear in mind that downtown hotels typically charge from $20 to $40 for overnight parking; you can save a bit at off-site garages, but a car is still a real added expense. Parking is far less or sometimes even free in Nob Hill and the Lloyd District, and it’s almost always free at B&Bs, which tend to be in neighborhoods where a car is handy anyway. Another big reason a B&B might make a better option than a larger hotel is that most of Portland’s are in lively neighborhoods abundant with distinctive shopping and dining, and most often, an inn will offer unique guest rooms, deluxe home-cooked breakfasts, and friendly and knowledgeable innkeepers—all in all a more personal and authentic Portland experience.